I am only 70 years old, but I have to say that never, let me repeat that, NEVER have I seen any politician whine as much as the #BLOTUS. He is a spoiled, petulant brat that has never grown up. He lies about the lies he lied to cover up the lies he lied about the lies. Then he whines about fake news and witch hunts. All his ill-gotten wealth cannot buy enough lawyers to keep him out of the sights of all the investigators on his slimy trail. He is close to being treed by the hounds of justice. 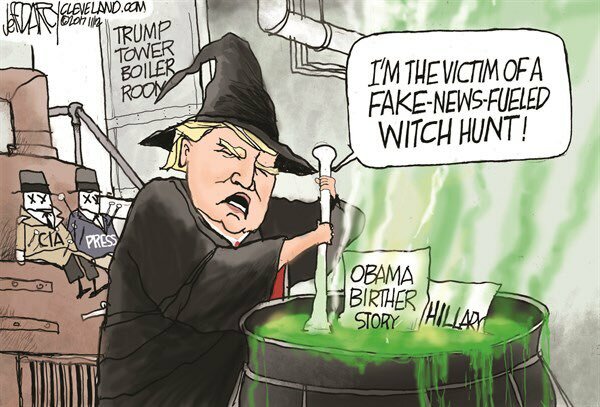 This entry was posted in News & Views, Quotes and tagged birther stories, BLOTUS, cartoon, CIA, Clevland.com, fake news, Hillary's emails, hounds of justice, investigators, lies, press, truth, victim, wealth, witch hunt on June 16, 2017 by Ray Buchanan. Let’s give credit where credit is due. The rich, top 1%, get richer by the hour, while the number of poor continue to grow larger and are sinking ever deeper. This is all happening at the same time the rich point their golden finger of blame at those that they are allowing to drown. Blaming the victim is nothing new, but it is uglier and more mean-spirited than ever. This entry was posted in Facts & Statistics, Hunger & Poverty, News & Views and tagged blame, debt, drowning, food assiswtance, food stamps, hunger, poverty, reality, rich, SNAP, tax evasion, truth, victim, working moms on January 16, 2016 by Ray Buchanan.